NEARLY TWO MILLION PEOPLE are working this week in the 26 Counties, some earning as little as €6.41 an hour. There are a small few earning millions - such as the three directors of Cement Road Holdings who in 2015 shared a €14million wage and bonus package. Inequality in Ireland is audacious in the scale of its disparities. Many of the two million workers face rising costs for daily living, from rent to food and healthcare. Working in this unequal Ireland is challenging. Employees have more qualifications and skills than any other generation of Irish workers yet they face decreasing job security from international competition. Almost one in four (23.3%) of Irish workers are low-paid, according to the 2015 Organisation for Economic Co-operation and Development (OECD) Employment Outlook; only five OECD states had a higher percentage. 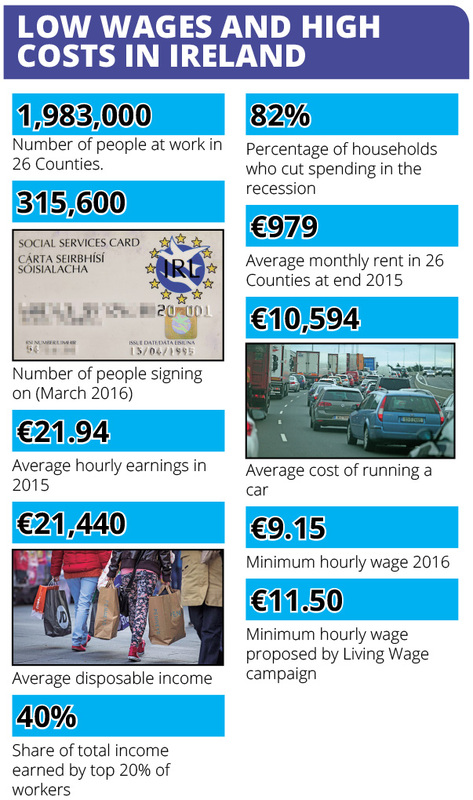 Irish workers also cope with living in the EU’s fifth most expensive country. Health, housing, transport are all more expensive than before the recession with the price hikes in these areas far outstripping families’ disposable income. Central Statistics Office (CSO) figures show 1,983,000 people at work. Another 315,600 people were signing on the Live Register in receipt of social welfare payments, with 65,477 working either casually or on short hours and so entitled to a welfare payment. Average hourly earnings were €21.94 at the end of 2015, slightly less than 2014. The CSO annual survey on Income and Living Conditions cites average annual disposable income at €21,440. Significant numbers of people have less income than this with the CSO showing that 16.3% of people have less than €10,786 annually to live on. The survey also shows that the top 20% of earners have consistently taken 40% of the total income before, during and after the recession. Meanwhile, disposable income has been cut by a stream of tax and price hikes. Already this year VHI health insurance premiums were set to increase 3% from the beginning of May following a 2% increase last November and a 3% increase in January 2014, a 23% increase in January 2009, 8% in 2010, 15% to 45% in 2011, 6% to 12.5% in 2012 and 6% in 2013. Yes, it really has been that much! In 2012, the CSO published a new section in their Quarterly National Household Survey on how households were impacted by the recession. It found that 40% of households had problems paying bills and debts; 82% of households had reduced their spending. Unfortunately, the CSO hasn’t repeated this survey since. In February, property website Daft.ie reported three years of successive rent increases. The annual increase for the 26 Counties in 2015 was 9%, with the average rent being €979. In Dublin, rent has increased 43% from the recession low of 2010; average rent ranges from €1,197 in north Dublin to €1,625 in South County Dublin. On top of these increases was the issue of supply with Daft reporting that “there were fewer than 1,400 properties available to rent – in a city of over half a million households”. 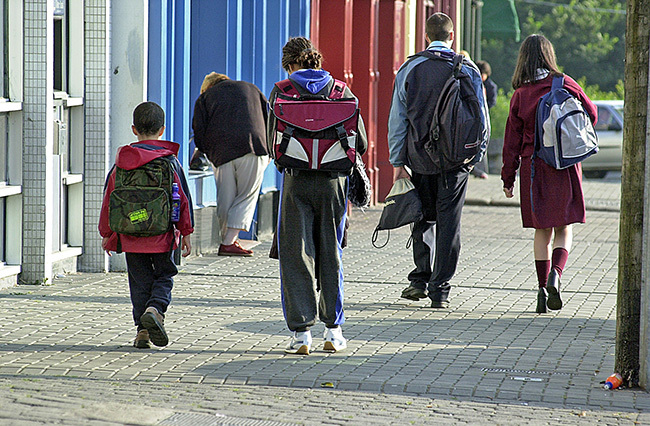 Other bills families have to meet are an average €800 annually for the costs of children attending ‘free’ primary schools and €1,300 annually for second-level students, according to Irish League of Credit Unions research. If you are lucky enough to afford a car, the AA estimated in 2015 that the average running cost was €10,594. 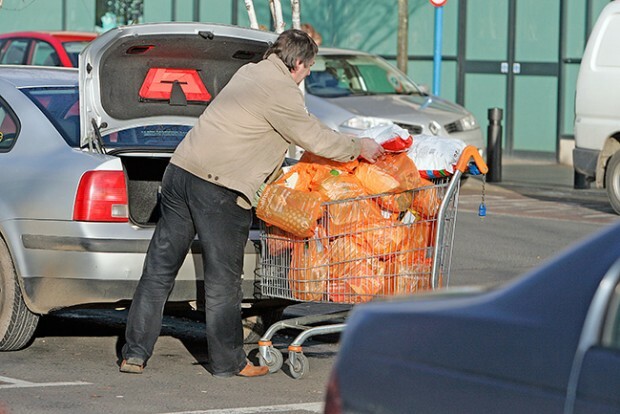 Fuel costs were down but this was eaten up by insurance price hikes of up to 25%, with the same again expected in 2016. According to consumer research firm Kantar, Irish shoppers spend an average of €104 a week, with prices rising already this year. In January 2016, the minimum wage increased 50 cent to €9.15 an hour. To get this rate you have to be over 18 and working two years. Under-18s get €6.41, 70% of the minimum hourly wage. Over 18 and in your first year of work you get €7.32, 80% of the ‘minimum rate’, rising to €8.24 in your second year of work. Trainees also start at the €6.41 an hour rate. €11.50 was the hourly wage set in 2015 by the Living Wage campaign as a rate “which makes possible a minimum acceptable standard of living”. The campaign group consists of SIPTU, Unite, TASC, the Vincentian Partnership, Social Justice Ireland and the Nevin Economic Research Institute. 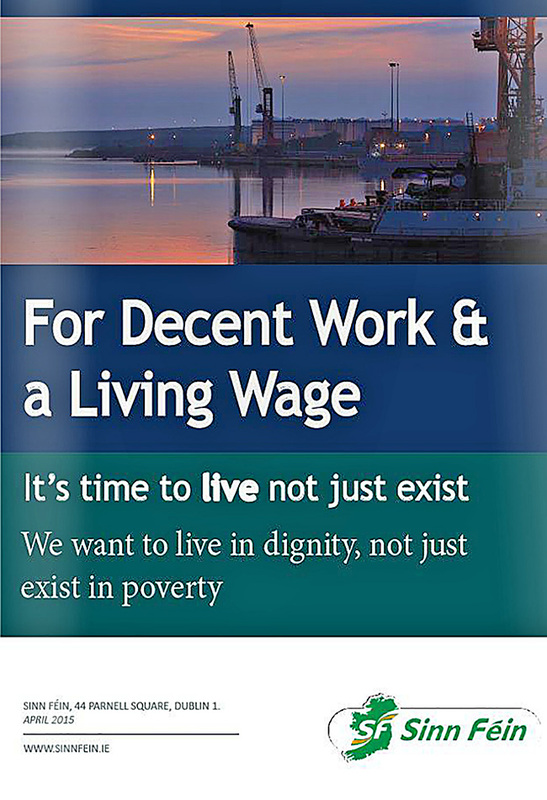 Sinn Féin’s 2015 document For Decent Work and a Living Wage outlines more detail on other social and economic supports that should be used to help our low-paid workers. Employers’ group IBEC thought the 50c minimum wage increase was a “mistake” and that “with heightened global economic uncertainty” it would be “a massive mistake to undermine our competitiveness through unwarranted pay rises”. It makes you wonder what percentage of its members were in the 82% of people the CSO found had cutback on spending during the recession, or the 40% who trouble paying bills on time? I didn’t think there were any either. 1,983,000 – Number of people at work in 26 Counties.